Our Full Size Folding Blackjack Table (#BJ7210) measures 73" long by 44" deep. 30" height Blackjack Tables (#BJ7210-30) and 36" height Blackjack Tables (#BJ7210-36) are available. The Table comfortably accommodates up to seven Blackjack players. Each Blackjack Table is precision-built in the U.S. by Master Craftsmen for superior quality. 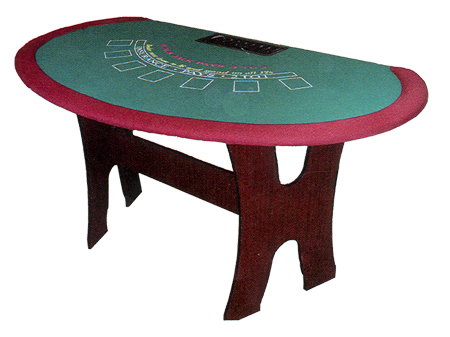 The table features a casino-green deep-dyed billiard cloth playing surface, black or mahogany wood laminate legs, and a red or black padded armrest/rail. Each table also includes an ABS plastic insert tray. For additional information on our Full Size Seven Player Folding Blackjack Table, please contact us at 1-800-233-0828. You might also be interested in our economical Folding Blackjack Table with Metal Legs (BJ57337) or our wide selection of Blackjack Supplies.